The search for the perfect banana bread - sweet, tender, moist (yes - moist), hearty - ends here. 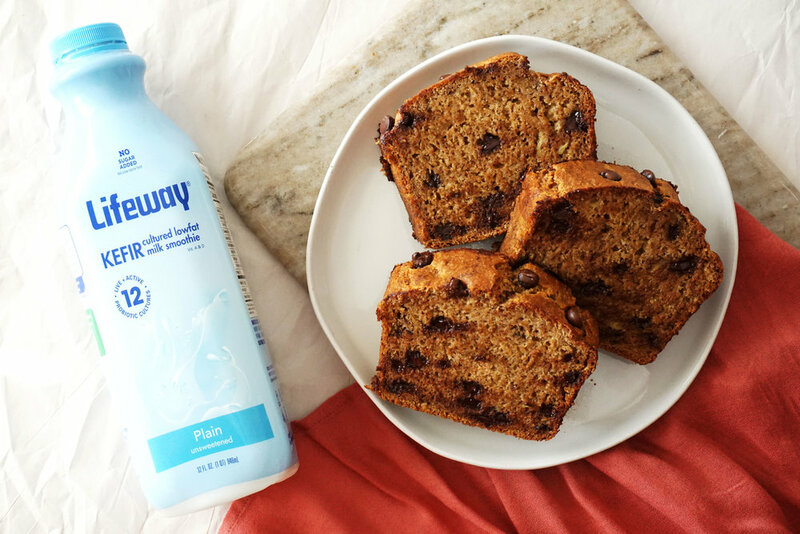 This Whole-Grain Chocolate Chip Kefir Banana Bread is the only recipe you’ll need from here on out! A bold statement, I know, but I would never lead you astray, especially when we’re talking about banana bread. Key ingredients here are: dark chocolate chips, Lifeway Plain Low-fat Kefir, and extra ripe bananas. Friends. Readers. Eaters. I have not been myself lately. What used to be my favorite time of year is (this year at least) becoming one of the most terrifying and devastating times in California’s history, and I cannot just go about daily life, paste a smile on my face, and pretend that things are okay. A handful of my close family and friends are the only ones who know the depth of my fear of fire. I’ve been hesitant to talk about it here, now, with all that’s going on because it feels, in a way, selfish of me to be discussing my fear of these wildfires, as someone who is unaffected, when hundreds of thousands are losing their homes and some even their lives to the fires. Less than a week ago, these fires broke out - both in Southern and Northern California - but it feels like it’s been ten times longer than that. Since then, I haven’t been able to let more than a couple hours go by without checking for news updates. There is nothing in this world more terrifying to me than fire. I’m not talking about the tiny flames on top of a candle, or the comforting warmth of fireplace. I’m talking about the wildfires that are ripping through California. My heart beats significantly faster, my hands shake, and my eyes fill with nervous tears at the thought of anything like what is happening in other parts of this state happening to this community. It’s all real. It’s happening. And I can’t turn away. Around this time last year, the Thomas Fire broke out in Santa Barbara, California and was then named the largest wildfire in the state’s history. I planned to drive to Southern California for the holidays to be with my family, but hadn’t really putting together the pieces of the puzzle - I needed to drive through the area of the fire in order to get to where my parents lived at the time. Never have I ever seen anything more frightening than what I saw while driving into Santa Barbara that day. Words cannot explain. It looked like what I would imagine Hell to look like. Mom answered my phone call, but I couldn’t speak. I just sobbed. When I finally got words out, they were, “I can’t do this, Mom. I can’t come home. This is terrifying. I’m shaking.” After turning my car around and driving back away from the fire for a while, I calmed down and my parents convinced me to take another route that wasn’t anywhere near the flames, and I did because I couldn’t imagine spending Christmas without them, separated only by flames and fear. This year… this year, the Camp Fire in Paradise, California is already - after just four days - the deadliest in all of California’s history. From six hours away, traces of smoke have traveled down here to San Luis Obispo, painting the sun an eerie orange color at dusk. The Woolsey Fire and the Hill Fire are consuming a massive portion of the Thousand Oaks area. And the more I write, the more I realize that I am not your main news source, so I don’t need to be giving you information on these, I guess. You already know, or at least I hope you do. I spoke on the phone with my dad the other day, and as it happened last year, I hadn’t yet put together the pieces that I will again need to drive through the area of the fires to get to where I’m spending Thanksgiving this year. Immediately, I couldn’t form words and my dad couldn’t understand through the phone what was wrong, until he remembered. If you’re wondering why I’m sharing this, it’s not to bring you down, to beg for sympathy. It’s to raise awareness of how severe and dangerous these fires are. It’s to spark thoughts in your mind and prayers from your heart for those affected. I don’t constantly check the news to scare myself, but rather to stay informed and educated on the progress of the fires and any potential new ones (please, God, no). From my 22 years of life experience, I’ve learned that one of the best ways to conquer a fear is to come face to face with it. Don’t think that I will be standing in front of these flames any time soon (or ever, for that matter), but I think that continuing to normalize myself with these situations, for as long as I live here in California, is helping. So… yeah. We need your prayers and support, and if you are able, your donations. Firefighters and civilians are working tirelessly to conquer these fires. They are living in a nightmare. Keep them and all of us in your thoughts and prayers, please, as we stay vigilant and faithful. Preheat the oven to 350F and lightly grease a 9x5 loaf pan with coconut oil or butter. Set aside. In a small bowl, whisk together the flaxseed meal and filtered water. Set aside to thicken for about 5-7 minutes. In a medium-size bowl, whisk together the mashed banana, kefir, agave nectar or pure maple syrup, and vanilla extract. Add the baking soda and baking powder and whisk again. Bubbles should form - science! In a large mixing bowl, combine the flour, cinnamon, and sea salt. Pour in the wet ingredients and stir until well incorporated. Add the flaxseed mixture and dark chocolate chips and stir again until combined. Transfer the batter to the greased loaf pan and bake for 60-62 minutes, or until a toothpick poked through the center comes out clean. Cool slightly, about 8-10 minutes, before removing the loaf from the pan. Once removed, continue cooling completely before slicing. Serve immediately and store leftovers in an airtight container in the fridge for up to one week, or in the freezer for up to two months. This post is sponsored by Lifeway Kefir. All opinions and statements are my own. Thanks for supporting my blog!